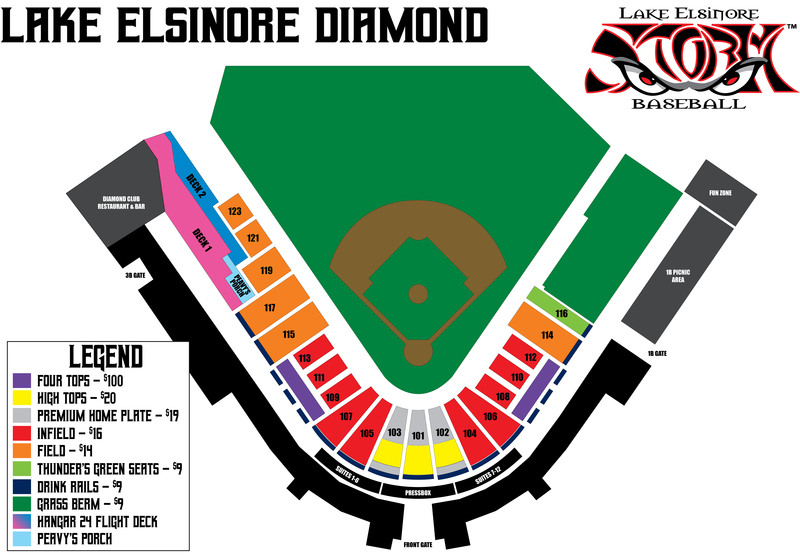 LAKE ELSINORE, Calif. - The Storm hosted the Rancho Cucamonga Quakes and Inland Empire 66ers during a festive Six-Game homestand from August 17th through August 23rd. As the Storm began the weekend 6 games back of the Lancaster JetHawks for the South Division Wild-Card spot, the boys split the homestand 3-3 and are still in the Wild-Card chase as we inch closer to the 2018 California League Postseason. It did not start off quite that way as they fell in defeat to the Rancho Cucamonga Quakes on Friday by the final of 8-6 and on Saturday 3-1. In those two losses, the Eyes had great offensive production from the top third of their lineup which includes Eguy Rosario, Luis Torrens. Rosario not only put together his second four-hit game of the season, but he went 5-for-7 with two runs scored and a walk. Catcher Luis Torrens added in with a 2-RBI performance in game one along with a key RBI-Double the following night to combine going 3-for-8 with 3 RBI and a run scored. On a Salute to Soldiers Sunday Funday, the Storm found a way to snap their 3-game losing streak and finish their season-series against the Quakes on a winning note. Following a quality start by southpaw Nick Margevicius where his line read, 6 IP/5H/2 R/0 ER/1 BB, his offense picked him up with two runs in the 2nd, a solo-run in the 5th and three runs in the 7th on their way to a 6-2 victory. Rod Boykin chipped in with a two-run double while the Bradenton, Florida native Brad Zunica recorded a three-hit game with 3 RBI and a run scored. The Quakes took the series two games to one, as well as the head-to-head series 21-10. On the bright side, the Storm won the book ends of the series winning the first game back on April 19th and the last on August 19th. With the 66ers visiting The Diamond for the final time this season and playoff implications in play, the Storm made the most of their opportunity before they embark on a weeklong road trip. It was a pitcher's duel on a Fiesta Tuesday between Reggie Lawson and Erik Manoah as just one run was scored in the entire game. When Edward Olivares stepped up to the plate in the bottom of the 3rd, the Venezuelan crushed a pitched deep to left field for his 10th HR of the season for the 1-0 lead. Lawson picked up his picked up his 7th win of the season, while reliever Travis Radke notched his 1st save with the Storm. The winning continued on Wednesday as a big 3rd inning propelled the Eyes to their third consecutive win. Following an error by the 66ers third baseman, Edward Olivares and Luis Torrens delivered clutch two-out singles which tied the game 2-2. The biggest hit of the night came off the bat of Chris Baker as he drilled a 3-run Double to the 425 FT sign to give the Padres affiliate the lead for good, 5-2. The bullpen trio of Korey Anderson, Caleb Boushley and Dauris Valdez shut down the 66ers offense to complete the game two win. As the series wrapped up on a Thirsty Thursday, it was a heart palpitating heartbreaker as the Storm entered the bottom of the 8th down 4-2 and madness ensued. The Eyes were gifted four runs on a hit-by-pitch against Chris Baker, followed by back-to-back errors by the 66ers defense. With the Storm leading 6-4 heading to the 9th, the bullpen suffered another meltdown as Blake Rogers and David Bednar were unable to corral the 66ers bats as they surrendered three runs on an RBI-Double to Richie Fecteau and Singles to Franklin Navarro and DJ Jenkins. The Storm would threaten in the 9th, but fail to score and fall in defeat by the final of 7-6. Starting pitcher Pedro Avila took the no-decision after going six innings and matching his season-high of 10 strikeouts, while shortstop Chris Baker drove in two runs on two hits, which now gives him a streak of recording at least one hit in 14 of his last 15 games. With 3 Games Back in the Overall Standings, the Storm will head out on the road for the final time in the regular season to take on the Colorado Rockies affiliate Lancaster JetHawks for a 4-game set at The Hangar, followed by a 3-game series against the Angels affiliate Inland Empire 66ers. Beginning on Friday, August 31st, the final homestand of the season kicks off as the Storm host the JetHawks. We will have Fireworks (8/31), 2019 Schedule Cup Giveaway (8/31 & 9/2) as well as Everything Night (9/3) on tap for the fans in attendance. You can purchase tickets for any of our remaining home games either online at stormbaseball.com or give us a call at 951-245-HITS (4487). Keep your #EyesOn25!